Roof Cleaning entails either power washing or soft washing. Power Washing is abusive and damaging to your roof, soft washing utilizes a high strength corrosive chemical. We provide the only product in SWFL that is environmentally safe, non-toxic, biodegradable, USDA approved, and it retards the regrowth of mold, algae, and fungus. It is also 100% safe to use around children, pets, plants and pools.an be of service please contact us to schedule an appointment or for a free estimate. Please provide information in form below and we will contact you to confirm your appointment. If you have additional questions please call us at 239-877-1344. Here in Southwest Florida our mold is like no other. 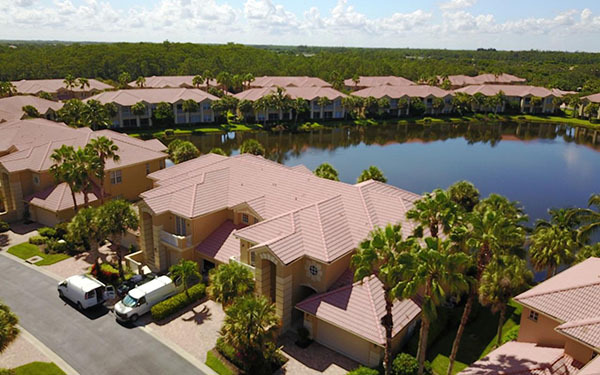 What would normally be 3-4 years between roof cleanings are thing of the past on an average your roof should be cleaned every two years at a minimum ( most single family homes located near water, homes are shaded by vegetation, and couple that with our humidity) we are in the perfect scenario for the growth of mold. Continued power washing of a roof regardless of the method used is to put it mildly abusive to your roof. The dragging of hoses, the caustic chemicals some companies use and continued pressue cleaning of roofs opens the pores in your roofing material allowing the mold to get a better foot hold. Constant roof cleaning is not the answer. Roof care maintenance is the answer to the problem. Our product is environmentally safe, USDA approved,100% bio-degradable product safe to be used around children, pets, and plants. Once a year a no pressure application 3- 6 months after a thorough cleaning and you're on track to restoring and maintaining your homes roof. Very happy with this service. Professional, efficient, and extremely polite. Will definitely use them again in the future! They made my roof look really good. I had no idea how much gunk was on my roof tiles.